We offer several different types and sizes of accommodations for visiting dogs to choose from depending on their individual needs. 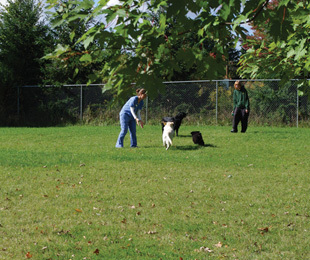 Extra-large indoor-outdoor runs large enough to accommodate the giant breeds are available. These spaces are also excellent for families with more than one pet they would prefer housed together during their stay. Regular size indoor-outdoor runs are comfortable for your large and medium-sized dogs and roomy enough for multi-pet families to keep two together. We also have a separate geriatric area for our older boarders where the environment is quieter. This is also an excellent area for young puppies or smaller, more timid animals. Special accommodations and arrangements are also available for special needs pets such as diabetics or other pets on special medications or need extra supervision. Of course, a veterinarian is always available to monitor special cases. 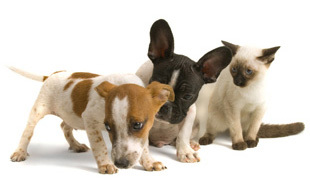 We will happily discuss your pet’s needs and help you decide what is best for your pet. Cats are always welcome at the Dahl House and special condominiums are available for their comfort. Condos may be combined and will accommodate several felines from the same family if desired. Cats are housed in an area separated from the canine areas to relieve stress and are offered the same special needs monitoring as the dogs if required. We have the ability and the experience to house and care for many exotic pets. Please contact us to discuss your individual requirements. It is important for your pet’s well being to remain on their regular diet. We provide Bil-Jac products and all of the Hill’s Science Diet products in house, along with a variety of treats. If your pet has special dietary requirements please discuss this with us at the time you make your reservation. When an owner is apprehensive about leaving their pet in our care, that anxiety can be telegraphed to the pet and adversely affect the pet’s experience. In an effort to alleviate some of that stress for a first time visitor, we offer to have you make an appointment when it would be convenient for you to drop your pet off in the morning and leave him until later that same day, at no charge. This will allow your pet the opportunity to meet the staff, enjoy some treats, maybe a little brushing, lots of attention and a walk around the grounds. When you return later in the day, your pet will realize you will return for him the next time he visits. We have found this to be a very successful way to introduce a pet to the boarding experience and to relieve the owner’s worry.